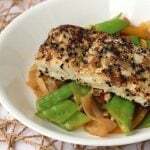 Spread both sides of each halibut fillet with mustard (1 teaspoon per side). Cut the fillets in half (making four pieces total). In a shallow bowl, mix together coconut and sesame seeds. Coat both sides of each halibut fillet with the coconut mixture. Season with pepper. In a skillet large enough to hold all four fillets, heat olive oil over medium heat. Add halibut and cook for approximately 4 minutes, then turn and cook another 3 minutes or so. The fish should be golden-colored and opaque all the way through.